WASHINGTON (Reuters) - U.S. government watchdogs rapped two members of President Donald Trump's Cabinet on Monday over their spending last year, adding pressure on an administration already roiled by ethics complaints. 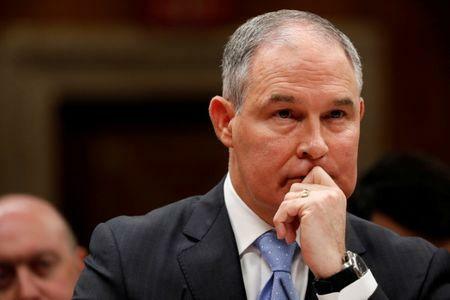 The U.S. Government Accountability Office (GAO) said the Environmental Protection Agency violated the law when it approved a $43,000 soundproof phone booth last year for Administrator Scott Pruitt without seeking approval from lawmakers. And the Department of Interior's Office of Inspector General said Interior Secretary Ryan Zinke took an unnecessary charter flight in June after a speech he made there to a professional hockey team that cost taxpayers more than $12,000. The new reports come as the White House seeks to shake off persistent criticism by lawmakers of ethical lapses and wasteful spending by Trump's senior officials - something that has helped fuel a high rate of turnover. Health Secretary Tom Price was forced out and replaced last year after reports emerged of lavish spending on flights. Pruitt and Zinke are viewed as among Trump's most productive Cabinet officials and key to the president's policy of expanding energy production and exports by slashing environmental regulations and opening federal lands to drilling and mining. Trump has rebuffed recent calls by both Democratic and Republican lawmakers to fire Pruitt, saying he is doing a "fantastic job" and is well-loved in "coal and energy country." The Government Accountability Office said the EPA violated the Financial Services and General Government Appropriations Act with Pruitt's privacy booth. The law prohibits an agency from obligating more than $5,000 in federal funds to furnish, redecorate or make improvements in the office of a presidential appointee without first notifying appropriations committees in the U.S. Senate and House of Representatives. The booth, which Pruitt had told lawmakers in a hearing was needed to conduct agency business, was built in a former storage closet in the administrator's office. The GAO had been asked to investigate the matter by Democratic lawmakers. Senator John Barrasso, a Republican and the head of the Senate environment committee, said in a statement after the GAO's decision that Pruitt's agency must give a "full public accounting" of the spending. Also on Monday, the EPA's Office of Inspector General released documents showing EPA's chief of staff, Ryan Jackson, had signed off on pay raises for three of Pruitt's staff, including a raise of $29,000 to above $114,000 for his scheduling director, Millan Hupp. Pruitt had originally recommended the raises but was denied by the White House. Jackson approved them using the authority granted under an obscure provision in a clean water law, the documents said. Pruitt told Fox News this month that he had no knowledge of the raises. EPA spokesman Jahan Wilcox did not respond to a request for comment. The Interior Department's watchdog said in its report Monday that Secretary Zinke chartered a plane for $12,375 from Las Vegas to Kalispell, Montana, in June that "could have been avoided." The flight was linked to a controversial visit Zinke made to a National Hockey League team owned by a campaign donor. "We determined that Zinke’s use of chartered flights in fiscal year (FY) 2017 generally followed relevant law, policy, rules, and regulations," the report said. "We found, however, that a $12,375 chartered flight he took in June 2017 after speaking at the developmental camp for the Golden Knights, a professional hockey team based in Las Vegas, Nevada, could have been avoided," it added. The report said the visit appeared unrelated to Zinke's work as Interior chief, pointing out that a video recording of the speech showed he never mentioned his role at the department and focused mainly on his experience as a Navy SEAL. The hockey team is owned by Bill Foley, a donor to Zinke’s past congressional campaigns. Heather Swift, an Interior Department spokeswoman, said the report "said exactly what was known all along," that the chartered aircraft followed relevant law and regulations. She did not comment on the watchdog's finding that the Las Vegas flight could have been avoided. Zinke has also defended his use of noncommercial aircraft as necessary for reaching the remote parts of the country that his department oversees, and said past Interior secretaries have also relied on them. Zinke has also taken heat for other types of spending, including the repair of doors in his office that cost thousands of dollars.